Baron von Brüegala is a second-generation Beer Baron. His father, the first Beer Baron, grew up in the Black Forest, the son of a rich cake merchant. At an early age, his father shunned the pastry world and turned his talents to the brewing arts. For many years he tinkered with hops, barley, malt and water, occasionally all at the same time. His exploits in brewing became legendary. He was named the first official beer baron and was renowned across the motherland as much for his beer as his whiskers. His whiskers were breathtaking. So much so, he was the first man to have his whiskers knighted. He was a baron and his whiskers were knights of the realm. On any given night, the Baron could be heard arguing with his whiskers over the political issues of the day. Their arguments were fantastic and occasionally the Baron’s opinion would win out. As the first Beer Baron, he traveled the world drinking beer and extolling its virtues to the masses and local farm animals. In fact, there’s nothing he loved more than a day spent drinking and extolling, extolling and drinking. Some say next to beer, extolling was the first Baron’s second love. 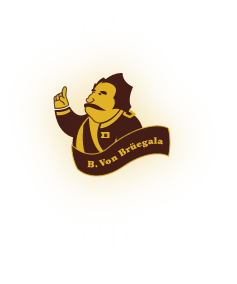 The Brüegala Beerfest was established by Baron von Brüegala to honor his father and the beer he loved so dearly.